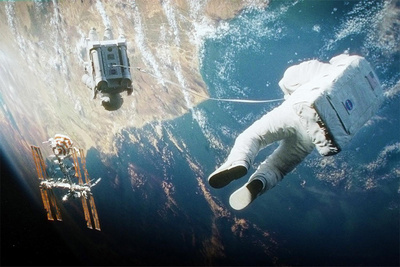 The International Space Station takes about 90 minutes to orbit the planet, travelling at 17,500 miles per hour and the new “Gravity” film takes exactly 90 minutes to keep you in real awe for every single mile. I don’t usually write for films I see. Actually, I’m afraid I’m becoming one of these grumpy old men who miss Antonioni, Fassbinder, Ford and always planning to watch the best film ever, the “Battleship Potemkin” next weekend. Saying that I do go tot the cinema and I love it. I watch contemporary productions even all made from computers and I do avoid 3D because watching a film with two pairs of glasses one on top of the other is not fun. Gravity is all that, contemporary with a lot of computer effects and 3D. Plus, the Don Juan of modern Hollywood, George Clooney and Miss Congeniality, Sandra Bullock. That and directed by Alfonso Cuarón with a little princess and a Harry Potter in his directing past. Not the best for a grumpy old man. And then it was space. And there is no sound in space. And there are stars everywhere and in the horizon 350 kilometres away, earth. Looking at earth through Clooney’s helmet is magnificent and I have to admit that I felt envy for all those astronauts that had the chance to see that view. With the help of technology and the 3D prospective the view couldn’t get more realistic. Now I’ve read about all the academics and their arguments. I even read that the director of NASA had to interfere and remind everybody that it is just a film aiming entertainment but the vast majority of the viewers are not professors of astrophysics or astronomers and for most of us space is encyclopaedic knowledge and place of miracles and mysteries. And in this realistic world with miracles and mysteries, Cuarón showed us that there are also dangers. No metallic robots or acid blood aliens. Real dangers, things that can happen. Now. Not in a far-far away future but in a space station that is already aging above us, reaching retirement age. George Clooney in his short of Buzz Lightyear character is really good but Sandra Bullock is brilliant. America’s sweetheart is a tomboy fighting desperately for her survival. Both very persuasive in their roles make you soon forget Don Juan and Miss Congeniality and become them, Lieutenant Matt Kowalsk, the cynic astronaut and Dr Ryan Stone who fights between loss and survival. For me, a fan of Stanley Kubrick's 2001: a Space Odyssey, the influence on Alfonso Cuarón was obvious everywhere. The long silences that give you the chance to admire or better feel the environment, the space and yes, the silence are there even not so popular any more among contemporary directors. The faces without words were also there, another Kubrick influence and the attention to the smallest detail, sometimes details you don’t even notice, was there. Alfonso Cuarón is not Kubrick but he is damn close. Now one thing I also liked about this film and I really hope the success it seems to have will not contradict me is that it is one of this films with no sequel or number 2, 3, 4 and 7. It is just these 90 minutes. The time the International Space Station takes to orbit Earth. I’m not sure if you could cast the film as a thriller. There is definitely a catastrophe, there is fear and actually you might find yourself in need to close your eyes a couple of times. I would never cast it as Sci-Fi, as I said before accident like that can happen now, this minute. There is adventure but under pressure and in need to survive it is amazing what humans can do. There is drama but it is well expressed, not overdramatized, human drama. One thing for sure, this is a film you must see. I haven't seen this film as of yet, but after reading your review, and determined to do so. Thank you !